These are bare addressable 5 meter long 5V RGB LED strips that come packed with 60 WS2812s per meter. 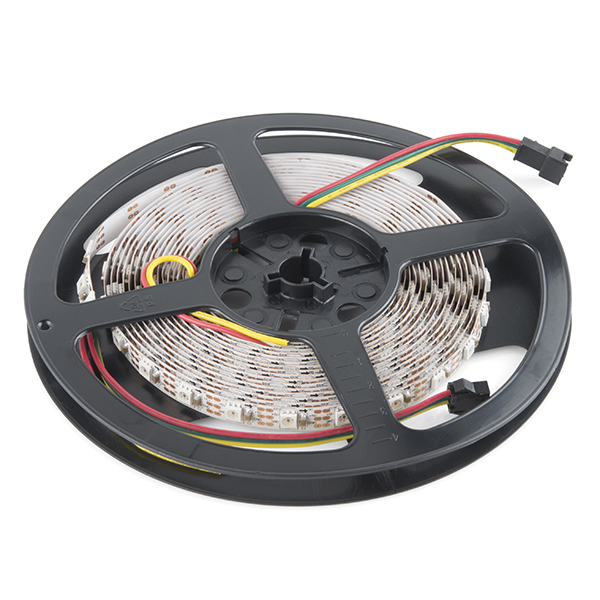 As these are bare LED strips that have no protective coating, your project won't be water proof but there is access to each WS2812 LED and each strip length can be easily modified. You will be able to control each LED RGB individually giving you the ability to create cool lighting effects for your car or perhaps under cabinet lighting in your kitchen! Note: These come in 5m segments on a reel. They are preterminated with 0.1" spaced 3-pin connectors as well as a 2 wire power connector, as shown in the pictures. 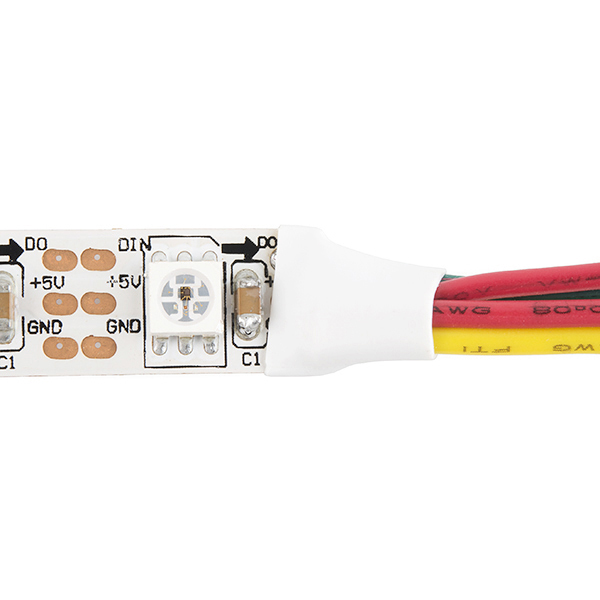 How to create a pixel string with the WS2812 and WS2812B addressable LEDs! Add blinking lights to any holiday decoration with our Holiday Lights Kit using WS2812-based addressable LEDs! Learn what it takes to build large LED installations from planning to power requirements to execution. In this tutorial, we will be connecting a Mean Well LED switching power supply to an addressable LED strip controlled by an Arduino. 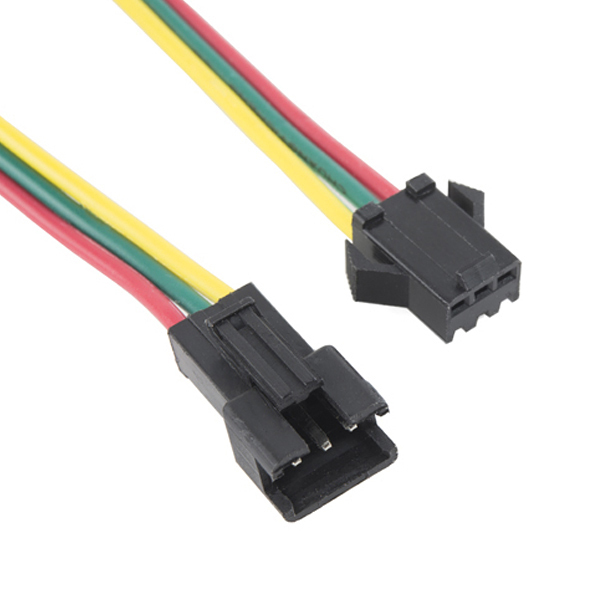 I'd like to find 90-degree angle headers that I can clip the three-pin connectors into. Does anyone know where I can find some? I haven't been able to find them anywhere. I want to solder the header to a custom PCB and clip the strip into it. What's the exact width of the strip, in mm? I just need to know if it's <= the pitch of the pixels, to determine whether it's possible to make a grid of square pixels. Can anyone say the difference between the ws2182 and the ws2182b? The reason i ask is the 1m units are out of stock but i see ws2182b 1m units on other sites. Trying to figure out if they are same product. time is critical, otherwise i would wait for them to be back in stock. Do these have anything to do with adafruit? 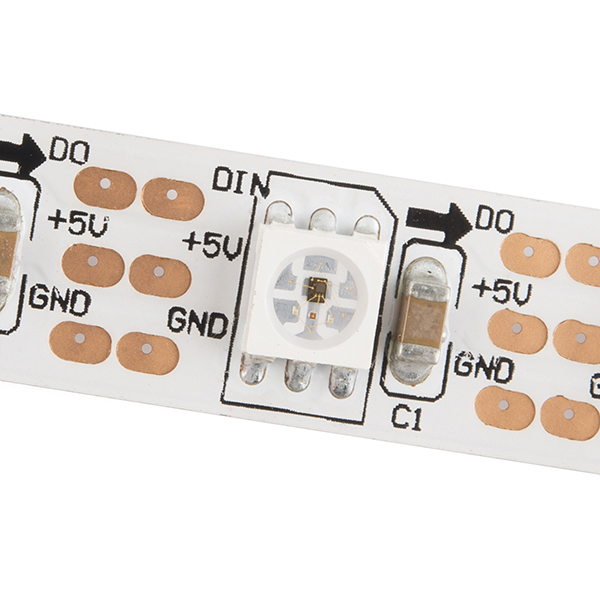 Their site seems to claim they make them, but I see addressable led's available in a variety of places and can't tell if everyone is a reseller or if someone in the US is actually manufacturing them. I know Adafruit uses the same LEDs (WS2812/WS2812B) in their Neopixel line which I believe they did design. I'm not sure if they designed a similar strip to this or not. We do not get these from Adafruit and as far as we know there is no affiliation with these strips. Also, these do not seem to be manufactured in the US. I like to connect these leds with 4 or 5 meters of spaces between them in 550 groups. each group containing two led's. So in total 1100 leds will be connected to each other. Do you think I will have signal loss over somewhere? How much current is safe to run through the strip? If I get a 20A power supply to run a 5m strip, how often (how may meters) should I connect power? Adafruit have a lot of content on how to deal with these (they call them 'NeoPixels'). They recommend powering them in 1m lengths, so connect every metre. 20A will be fine driving 5m of these at peak. What battery pack, volts and amp, is ideal to run 5m length? I will primarily be cycling between blue and purple lights only,.. any idea how long the battery will last on one charge per amp? As asked on the waterproof ones, if you turn all on full you get 18A. This obviously won't support that so what would the limit be? As for the "this obviously wont support that", you have to remember to jump in additional current every couple meters. With that in mind, I have personally driven various WS2801/WS2811/WS2812 modules & strips up to >60A... no issues at all. Other than frame-rate issues, I see no reason you cannot go for creating a Ultra-HD display with these things. I mean shoot for the stars, right? What are the restrictions for cutting these? From the pictures it seems you can cut them at any length (not limited to sections of three LEDs). Also, the link for the Product Video doesn't work (video was removed). You can cut them down to single LEDs. Basically they provide two sets of pads that you can cut between. Or on the flip side, if you want to put them back together, the pads are close enough to just use a solder-bridge for re-connection. Very Bright at Maximum Brightness. Requires about 5v@20A~100Watts to drive the strip. Make sure you have a capable power supply. The strip will fade to red (low power) if you power it from only one side. You will have to run power from both sides or to multiple points along the length due to resistance. The logic level ground is critical. Especially at 3.3v. Make sure you run a common ground between the LED power supply and the Logic board you are using to drive the color data. The two best libraries available for driving these strips are the Adafruit NeoPixel library and the FastLED Library. Mistakenly received the GRB variation by accident, but it great enough to overlook. I was shipped the GRB variant by mistake, and had to do some minor tweaks to my code to compensate. Normally, I'd dock a star for that, but I'll give a pass because of how robustly designed the strip is. I accidentally connected it backwards (5V to GND and vice versa). My power supply was shot of course, but the strip is still in perfect working condition. Sure, a couple unnecessary lines of code may be annoying, but not nearly as annoying as having to replace a $100 purchase.